Leaving Utila, we crashed in San Pedro Sula, a large city in Honduras that leaves much to be desired. The following day we took a boat to Belize City, before heading up to Chetumal, the first stop at the Mexico/Belize border. Luckily, we had no more border mishaps, and after an overnight stop, made our way to tourist hotspot, Cancun. I wasn't expecting much from Cancun, and was well aware before we got thee that it was purely a man-made resort, catered towards the package-deal tourists. Having said that, I thought it would be quite nice to be in touristy comfort, and that we could just chil out for a few days without any problems. I hated it. Not being able to afford to stay in one of the many hotels, we stayed in a hostel downtown which was only really good for its proximity to the bus station, so we had to get buses to and from the densely-populated 'hotel zone'. The hotel zone is just one huge road packed full of...hotels, with the odd American chain restaurant and overpriced bar thrown in. It completely lacked any kind of character, culture or interest, and just reinforced to me what I already know: that I hate places like this. There are places excatly like Cancun (i.e. identity-lacking resorts) all over the world, so why so many people from the UK bother flying all the way to Mexico, I don't know. Each to their own I suppose. We had a nice few days on the beach, and to be fair, the turqoise sea is amazing, but by day 3 we were bored and itching to leave my idea of tourist hell. 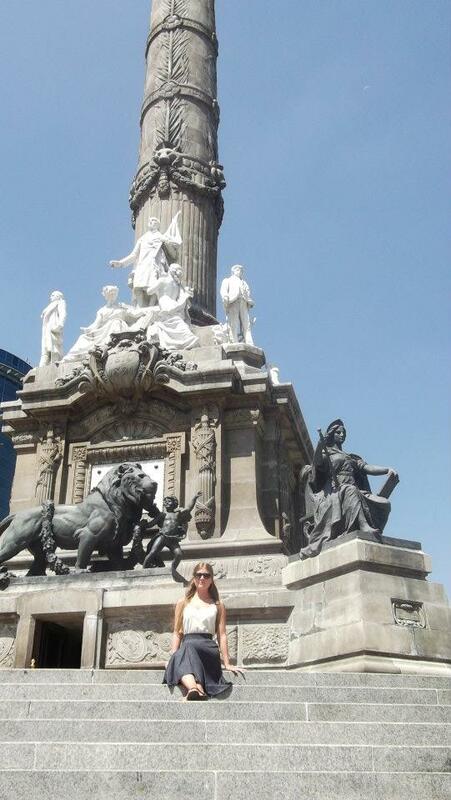 We flew to Mexico City - the capital that is in stark contrast to Cancun. It is 2400m above sea level, so relatively colder, but having endured Cusco and the Inca Trail, we mastered the altitude. The city is huge and brimming with history and culture, so we really only saw a snapshot of it in the couple of days that we were there. Mexico City is made up of intricate old buildings, cobbled streets and squares that wouldn't have looked out of place in Europe - although most of the buildings seemed to have a lean to them (including our hostel which was slightly disconcerting). What I found though, as with Granada, was that there was a lot of poverty, and I couldn't help thinking that the city could be amazing if it was just cleaned up a bit. We spent our days wandering around the 'centro historico' and 'plaza colonial', dipping in and out of churches and museums. However, the one exhibition that I was most looking forward to see - 'Andy Warhol: the Bazaar years' was closed the two days we were there. Figures. Not exactly Mexican, I'll admit, but I needed my fashion fix.